Posted on Sat, Feb 25, 2012 : 3:49 p.m.
INDIANAPOLIS — Mike Martin loves his former teammate, David Molk, like a brother. And, as tends to be the case, he won't settle for anything less than one-upping his brother. Molk, the Michigan football team's Rimington Award-winning center, blew away the field Friday during the first day of the bench press at the NFL Scouting Combine in Indianapolis. His 41 reps were the high of the day, and seven more than any other offensive lineman. They're a high among centers going back to at least 2005, when records began being kept online for the position. "I’m happy for him, but I have to beat that," Martin said, laughing. "I’m not leaving here without beating him, so that’s my benchmark." Mike Martin (right) wants to beat David Molk's bench-press effort. Martin, a defensive tackle projected to be a mid-round pick in April's NFL Draft, has kept all but one of his combine goals a secret: He wants to topple Stephen Paea's record of 49 reps in the bench press. He thinks he has a shot to do it, after seven weeks of training with former Michigan strength and conditioning coach Mike Barwis. Their workouts began Jan. 4 — the day after the Sugar Bowl. Martin said his personal best is 42 reps of 225 pounds, although that came after an exhaustive workout. Molk had a similar combine training philosophy. His personal best entering the week was 39, which came after a long workout. He said he was primed to hit at least the mid-40s, but slipped on the bench, which limited him to 41. "I’m beating that, definitely," Martin said, laughing again. "You can put that down on the record. There’s no way I’m letting him beat me, and I’ll tell him that." Martin checked in at 6-foot-1, 306 pounds. That's an inch shorter than his listed Michigan height, and a pound lighter than his Senior Bowl weight. “Probably used the bathroom a little bit too late,” Martin quipped. The combine is as much about the meetings with team personnel as it is about bench presses or 40-yard dash times, and Martin said that end of things has gotten off to a good start as well. Martin said the Houston Texans, Pittsburgh Steelers and Tampa Bay Buccaneers have told his agent, Chicago-based Rick Smith of Priority Sports, they are seeking a defensive tackle and are interested in him. The Texans have shown consistent interest in Martin since the end of the college season. Martin said the best conversation he had at the Senior Bowl was with their general manager, Rick Smith (yes, the same name as his agent). Martin said the Texans were one of two teams that requested to meet with him his first day at the combine. He also said he'd love to play with the Steelers, who feature former Michigan standout LaMarr Woodley, a friend of Martin's. "My boy Woodley, he’s putting in a good word for me," Martin said. "That’d be sweet (to play with him), man. That’d be sweet." Sat, Feb 25, 2012 : 11:14 p.m. The &quot;Little Big Men&quot;, the steals of the draft. I hope Martin goes to my Steelers because we need someone to replace Hampton. Go Blue, Baby! Sat, Feb 25, 2012 : 10:42 p.m. 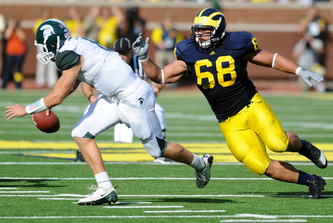 I hope a U-M guy can set the record at the bench press at the NFL Combine and wish Mike Martin the best. That would be cool if he can do it. As for Barwis, I always thought highly of him, especially what he did with Mealer's brother to get him to walk again. That was pretty special. Barwis and Fred Jackson were the two coaches I thought were worth keeping, but I was glad to see the rest of them go. As a Lions fan I wish they would take Martin but they're pretty set at the d-line for the most part. Sat, Feb 25, 2012 : 10:15 p.m.
Molk put on a lot of weight using Barwis method and eating 6600 calories a day. I just wonder what the long term health effects are of eating that much. I can't imagine it's good for ones health. Mon, Feb 27, 2012 : 10:07 a.m. The long term health effects of eating 6600 calories a day? You apparently don't understand how the human body works. How many calories you eat each day, in and of itself, means absolutely nothing. What those calories are comprised of and what you do with them once they've been imbibed is much more important. Sat, Feb 25, 2012 : 10:30 p.m.
Have you looked at the long term health effects of playing football? Sat, Feb 25, 2012 : 9:19 p.m.
Big mistake not keeping Barwis. Sun, Feb 26, 2012 : 1:13 a.m. I don't see why it's a 'big mistake' or a mistake at all, for that matter. The team was bigger, stronger, and fitter last year then they were in the three seasons with Barwis here. On top of that, they went 11-2 and won a BCS bowl game. Hard to find a 'big mistake' in those results. Sat, Feb 25, 2012 : 9:55 p.m. I respectfully disagree, because when Barwis was here we were too thin, and the injury bug was always present. Yes, he is highly effective for training only ...but combining it within a season just does not work. A player has to be big, strong, and in shape not just be in shape. On the other side of this is RR, in how he kept the defense on the field. I suppose Barwis could of prospered better under a better head coach. Sat, Feb 25, 2012 : 9:03 p.m.
Those who questioned why these guys did not work out at the U o fM and went to workout with Coach Barwis now maybe understand why? He gets results from his athletes. Sat, Feb 25, 2012 : 10:56 p.m. Since Martin picked Barwis to work out with tells me that Barwis is pretty good at what he does because Martin had also spoken highly of the current U-M coaching staff, also. Sat, Feb 25, 2012 : 10:12 p.m.
Ditto- Bench pressing and eating 7000 calories a day didn't translate on the field last year. Sat, Feb 25, 2012 : 9:15 p.m. It's clear that Barwis can help with the measureables, but it sure didn't translate to the field.